Akire Bubar is a highly spirited performer with engaging presence and polish. She is blessed with a strong and moving voice which she couples with seasoned guitar playing and frequent audience participation to provide a fun and illuminating show. 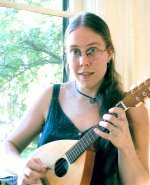 She has a wide repertoire, based in her own fine writing and ranging outward to include traditional folk songs and the work of other contemporary songwriters such as Bob Franke or Cindy Kallet. From the stark, crystalline clarity of an a capella song, to a bouncy delta blues or a silly singalong, to intricate tales of the spirit deftly illustrated in smooth, delicate guitar work and a voice that is sure and flowing, Akire composes an evening to remember. A performer from an early age and a full-time musician since 1998, Akire has headlined at numerous venues throughout the northeast and has opened for a variety of well-known performers, including Vance Gilbert, Fred Small, and Martin Simpson. Her recording of "The Butternut Tree" was recently included in the Fall 2001 edition of Sing Out! Magazine. She was one of six winners of the NJ Folk Festival's "New Folk" Showcase in 2000, a recipient of a Meet the Composer grant via The Lansdowne Folk Club (Lansdowne, PA) in 1999, and one of five performers receiving the People's Choice Award (The Folk Factory, Philadelphia, PA) in1998. Akire has five album credits to her name, singing harmony vocals on recordings by Susan Bush, Liza DiSavino, Patrick Regan, and two by Mike Agranoff. Akire's first CD, Arms of the Sun, was released in October of 2000. Described as "a cross-section of modern folk" (Richard E. Dansky, Green Man Review), this widely varied recording spans the range of Akire's songwriting and includes a few 'traditionalesque' gems penned by her contemporaries. While primarily a solo album, the CD also features notable performances by several of the members of Broadside Electric, Tom Grant of the Jive Five Minus Two, Susan Bush, and others. The album is a powerful tribute to the devotion of her fans, as it was funded largely through the support of her extensive fan base via fundraiser house concerts and outright donations. Says Allen Foster (Songwriter's Monthly), "Akire has just released an album to be proud of - really proud. She stands boldly naked with just her talent, and it's intensely captivating. Pay attention, this woman's got the magic!"